Sub:. Strengthening of District Common Examination Board (DCEB)in all districts— Roles and Responsibilities of new DCEB members and insiructions to all DEOs on Vidya Vikaasam Program -Reg. 3. Govt. Memo no. 420155/Prog.II/A1/2016 SE (Prog. II) Dept. Attention of all the Regional Joint Directors (RJDSEs), District Educutional Officers (DEOs) and District Project Officers (DPOs) in the state is invited to the reference 1st above, in order to strengthen the District Common Examination Board (DCEB), services of subjert teachers of School Education Department to work in DCEB have been taken and deputation orders issued to selected list of DCEB members who will work as District Assessment Cell members. 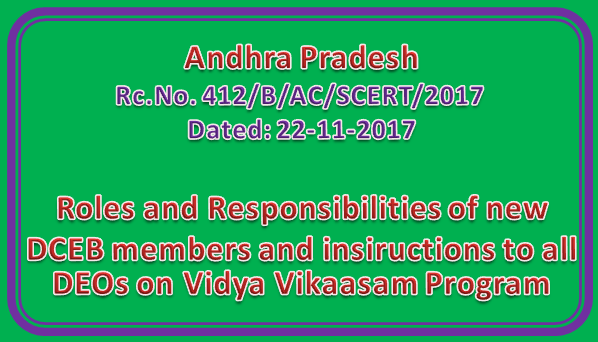 All District Assessnwnt Cell members will work directly under the DCEB Sccretary and are deputed permanently to only work on Assessment related work and activities of Vidva Vikaasam program, SCERT. They may not be utilized for any other work. Vidva Vikaasam program, in SCERT with the partnership of Samagra and CSSL is the Assessment reforms program started in the state. This program involves assessment capacity building in state and districts, high quality analysis of data collected. dissemination of insights to teachers and monitoring of action plan prepared by schools to improve learning levels.